Over the past week AKiTiO has formally introduced its new external graphics enclosure using a Thunderbolt 3 connection. 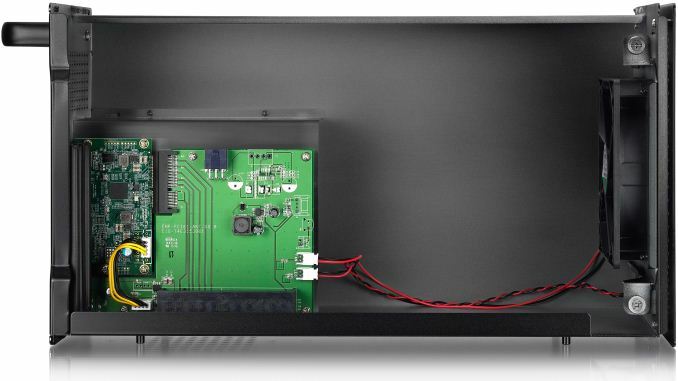 As with other external graphics enclosures, the AKiTiO Node allows a user to easily upgrade the graphics sub-system of notebook, AIO or SFF PCs that have a Thunderbolt 3 port by using a discrete graphics card. One of the key elements to eGFX is price and look, and AKiTiO has placed the Node at $299, but itcan fit graphics cards with massive coolers. 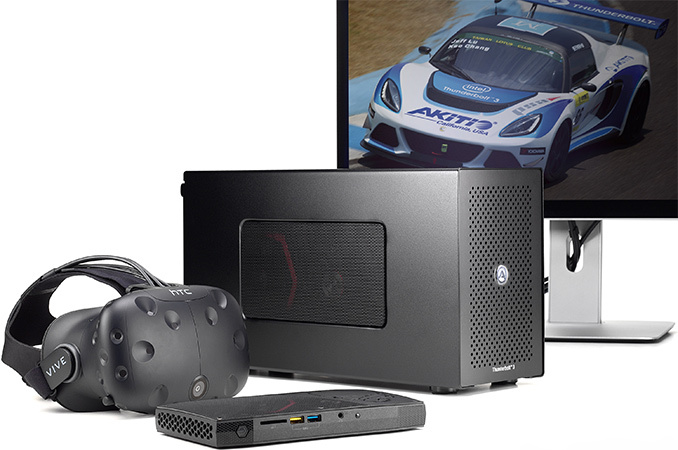 Enthusiasts started to experiment with external graphics over Thunderbolt 2 interface several years ago after multiple attempts of companies like ATI/AMD, ASUS and some others to develop commercial external GPU technologies had failed. Back in 2014, plugging a video card to a MacBook Pro using Thunderbolt 2 was costly: users had to buy a chassis for up to $1000 (there were cheaper methods, but they did not look solid), a PSU and a graphics board. The homebrew method worked, but had a number of limitations when it came to bandwidth, hot-plugging (more importantly, unplugging), driver support and some others, not to mention the aesthetics of such eGFX setups. Given the trend towards miniaturization of mobile and desktop PCs, the idea of external graphics was far too alluring to skip, which is why Intel decided to support it with its Thunderbolt 3 technology introduced in 2014. While technically TB3 is PCIe 3.0 x4 over a cable, to properly enable operation of external GPUs, Intel and its allies had to ensure support of eGFX hardware though operating systems, GPU drivers, firmware and so on. Earlier this year all pieces of the puzzle finally came together and the first “official” TB3 eGFX chassis were introduced by Razer and PowerColor. While both Razer Core and PowerColor Devil Box do the job and even feature a couple of extras, they are rather expensive as they add more than just GPU features - $499 and $379, respectively. This week, AKiTiO, which has been offering external Thunderbolt enclosures for years, introduced its eGFX box that costs $299.99. 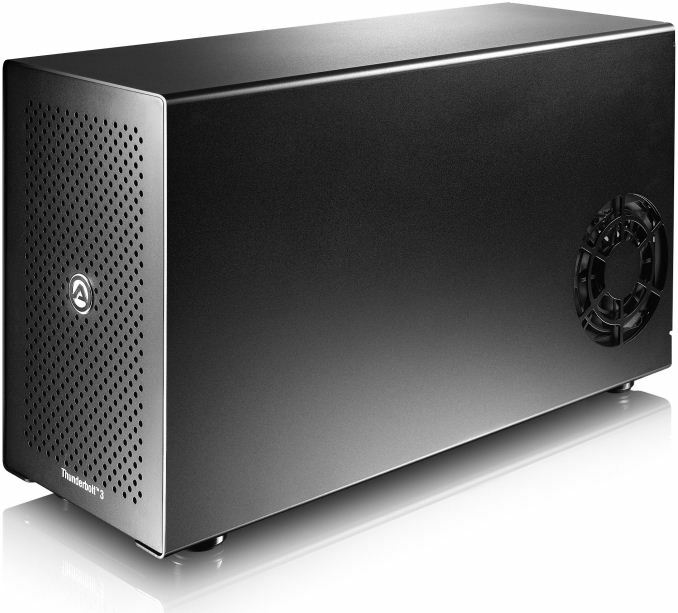 The AKiTiO Node is a 42.8 × 14.5 × 22.7 cm (16.85 × 5.71 × 8.94 inches) box made of stainless steel that is compatible with a variety of double-wide full-length/full-height AMD and NVIDIA graphics cards (see the list here). The Node comes with an integrated 400 W SFX PSU (which means that it can be upgraded) as well as one 120 mm fan. As for dimensions, the Node seems to be a little more spacious inside than its rivals, which is good for cooling and compatibility with custom video cards (such as those from ASUS or EVGA). Despite this, GPUs with hybrid cooling (integrated liquid cooling) are not supported, such as AMD Radeon R9 Fury X. Unlike competing products, the AKiTiO Node is a pure external GPU box and nothing more. It does not have extra USB 3.0 ports (to connect a VR headset, for example), a GbE controller nor a SATA connector. This naturally cuts down its costs and allows Akito to sell the eGFX enclosure at $299 price-point, but additional USB ports will be greatly missed by owners of ultra-thin laptops as well as SFF PCs. AKiTiO plans to start selling the Node (NODE-T3IA-AKTU) in December. In my opinion, this is the future of a pretty decent slice of the market. The emergence of several of these (especially like this one with a standard TB3 connection) is pretty encouraging. Does anyone know what Intel is actually charging for the TB3 controllers? It must be a lot, because we still only see TB on higher end mobos and portables. That seems like it's going to be the biggest problem for this market. If you can pop one of these boxes into just about any modern laptop, then they've got a good chance. But if things stay as they are now, and you have to carefully choose and pay more for a TB3 laptop, then overpay for these enclosures (you could literally buy a case, PSU & entire motherboard for half the price of this TB3 enclosure)... then I can't see these ever becoming anything other than niche products suiting people who are prepared to pay significantly more for the particular benefits they bring. The other problem, I suspect, is that we're seeing an increasing number of manufacturers producing pretty competent portable gaming laptops. Some of the recent 14" & 15" inch laptops with GTX 1060s, while of course bulkier than an ultrabook, still manage to be both relatively portable (~2/3" thick and under 4lbs) and extremely competent gaming machines. Many, as well, do this while costing far less in a single package than the laptop + GPU enclosure + GPU approach. We no longer live in a world where the only competent gaming laptops are 12lbs+ monstrosities. I think the best use for these is paired with an ultrabook that has a capable CPU but uses integrated graphics. The ultrabook has long battery life so you can do the types of basic tasks you typically want to be able to do while mobile - browse the internet, check email, work on documents, etc. Then when you want to sit down and play a game - which you'd usually do plugged in anyway - you plug into an external box like this (but preferably with those additional ports), that charges your laptop, provides connectivity for your external monitors, input devices, add-on storage for your game library, etc. I carry my Skull canyon NUC between work and home nearly every day, as it's a far superior desktop the one my work got me. With an external GPU I could game on it at home in high quality. You actually should read the test reviews it does not do wonders at all.